The Rotary Foundation is our own charity and supports Rotarians by enabling additional funding for their projects - both locally and internationally - as they 'Do Good in the World'. We have a separate website covering Foundation matters in Rotary District 1060 - the Heart of England. See http://foundation.rotary1060.org.uk for Forms to apply for Grants (and Crocus Corms), the latest status on the campaign to eradicate Polio from the World and other information that you may find helpful - like how to donate to our own charity in a tax efficient way. 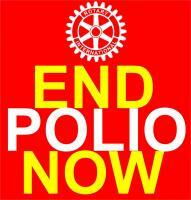 The 24th October is designated World Polio Day and is clearly a great opportunity to gain publicity and raise awareness for Rotary's Polio Eradication campaign. A variety of materials are available to support any activity planned around that time.